With the depressed state of the economy, companies are not giving much in the way of increases, vacant positions are not being filled, and contracts are not being awarded or renewed. How can individuals, entrepreneurs, small business owners and homemakers make the best of a bad situation? Armed with the same expert level of dealmaking skills as the captains of industry, you too can substantially improve your personal wealth and financial future. 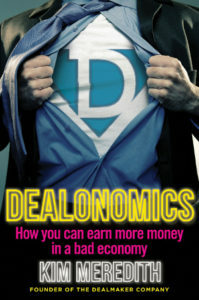 Dealonomics will equip you with the world class dealmaking expertise you need to get the income you want. The most successful people on any list have one dynamic in common – they are all dealmakers. 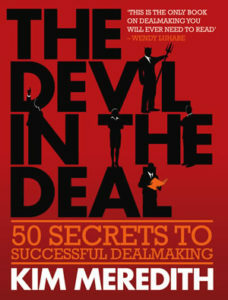 The Devil in the Deal reveals the 50 secrets that make deals, as well as the 50 devils that break them, in the real world. It debunks the myths, mysteries and chaotic theories surrounding dealmaking, thereby enabling you to acquire the expertise you need to become a world class dealmaker. Lively personal anecdotes and real-life examples make this a highly entertaining read, while practical steps and up-to-date expert advice will light the way for you to hold your own in any deal, with anyone, about anything. The fact is that women don’t know how to get what they want. In short, they do not know how to negotiate. 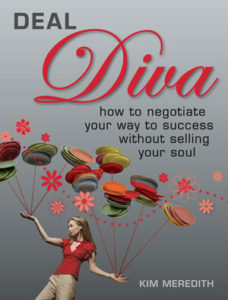 Deal Diva will arm you with the negotiating expertise that will allow you to hold your own in business and in life. From persuading your five-year-old to go to bed on time to getting the best price on a new car or closing a multimillion-rand business deal, the principles and processes in this book can be applied both at home and in the workplace. 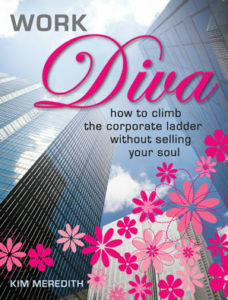 With invaluable advice from successful, high-profile women you will be equipped to make your way in whatever field you choose and get the deals you want. Linked to our books are our suite of programmes, especially designed to enhance your dealmaking abilities. The Dealmaker Company specialises in increasing the profits and revenues of organisations by developing their sales people into industry-leading sales professionals through its consulting services, programmes and academy.